The Augason Farms 48-Hour 4-Person Emergency Food Supply Kit is designed to not only sustain four people for two days, but to do so with exceptional flavor and the highest possible quality. Augason Farms knows that emergencies arise from a variety circumstances, whether stormy weather prevents a trip to the grocery store, a natural disaster that requires an evacuation from your home or you simply need a quick meal for unexpected guests. 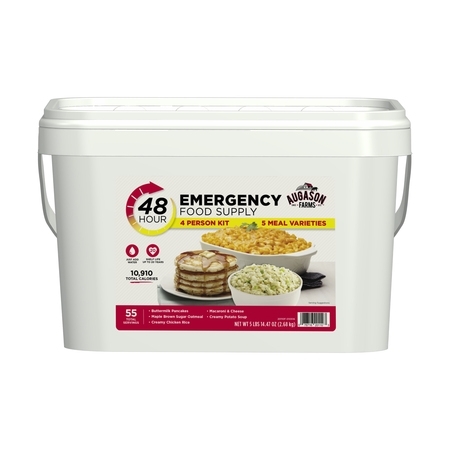 No matter the case, this food storage kit is an absolute essential in an emergency: it’s easy to transport and includes everything you need from breakfast through dinner. Make the wise decision and let Augason Farms give you a peace of mind that’s as indispensable as it is delicious. Perfect for Food Storage, Survival, Camping, Everyday Use, and an Emergency! Augason Farms recognizes that today’s consumers are more concerned than ever before about what kind of foods they eat, and want to provide their families with food that is safe and the best quality. Whether enjoying Augason Farm’s products for everyday meals, as an emergency food supply, or twenty years down the road, you can be confident that Augason Farms long-term food storage products are guaranteed for quality and taste every time. *Best when stored in a cool, dry and dark place at temperatures between 55°F and 70°F. Actual shelf life may vary based on individual storage conditions. Safe Handling Instructions: Contains oxygen absorber. Discard immediately upon opening. Not Five-Star Restaurant Cuisine, But Delicious! As a single person, it'll supposedly last me a week, which is ideal for winter snow-in's. These are wonderful for camping, aided by a trusty Coleman stove. Everyone should have at least one of these containers in their home per person for emergencies. We tested each meal with the plan to get more if we liked them and we really did. There is no excuse anymore not to be prepared.